American Fertility Services is ready to help fulfill your dreams of becoming parents or expanding your family. Dr. Joao De Pinho, Dr. Melvin Thornton and Dr. Jeffrey Wang have a combined fertility experience of more than 50 years and a proven track record of success. They and their team created AFS with a special focus on surrogacy and third-party reproduction. We offer a wide selection of comprehensive programs tailored to meet the needs of the LGBTQ community in our exceptional new facility and advanced assisted reproductive laboratory. AFS has an in-house egg donor program that simplifies the matching process. We provide personalized care with successful and guaranteed outcomes through our innovative financial programs. Start your journey to parenthood now by contacting us at info@americanfertility.com. See for yourself what a new concept in fertility is. Email us: info@americanfertilitly.com. Chelsea Fertility of New York City is a globally-recognized fertility center serving the NYC metropolitan area. Led by Dr. Beth Hartog and Dr. Paul Gindoff, recognized leaders in the field of reproductive endocrinology, Chelsea Fertility NYC is proud to assist in family building for LGBT, gay and lesbian individuals. Chelsea Fertility NYC is committed to offering the most effective fertility treatments available so anyone, regardless of fertility status or sexual orientation, can achieve their dream of becoming a parent. The fertility center’s facilities include an on-site laboratory, operating room, and cryopreservation technology, providing patients with convenient access to all needed services and lower overall treatment cost. Chelsea Fertility NYC also provides discounted pricing for a range of fertility treatments, including LGBT family-building services such as egg donation, surrogacy, intrauterine insemination (IUI), and more. New Life Mexico is one of the leading branches of New Life Global Network, a rapidly expanding group of modern fertility clinics and surrogacy & egg donation centers known all over the word for its remarkable reputation and high success rate. Our very first center was established in 2008 in Tbilisi, Georgia. Since then we have reached eight more countries in various parts of the world , helped more than 5, 000 families and single intended parents and completed up to 11, 000 IVF (In Vitro Fertilization) procedures. At New Life Mexico we welcome gay intended parents to fulfill their dream of parenthood. In addition to surrogacy & egg donation agency, New Life is represented by its own modern American IVF clinic in Cancun, Mexico where full array of Assisted Reproductive Technology (ART) services are provided. We have intended parents referring to us from almost every corner of the world, but great majority of our parents are from USA. Our highly qualified team of dedicated professionals is ready to provide gay-friendly and the high quality IVF, Surrogacy and Egg Donation services in the most comfortable and relaxing environment in beautiful Cancun, Mexico. Since 1989, San Diego Fertility Center (SDFC) has played a role in bringing more than 4,000 babies into the world. As a world-class reproductive center San Diego Fertility Center provides a comprehensive range of LGBT patient care, including intrauterine insemination (IUI), egg donation, surrogacy, and more. Gay, lesbian, and transgender couples travel from around the world to the clinic’s Southern California offices for state-of-the-art fertility treatment. SDFC is committed to providing LGBT couples with the high-quality, individualized reproductive care they rightly expect and deserve, with the belief that everyone who wants to build a family should be able to do so. The fertility doctors at San Diego Fertility Center work closely with patients to map out a treatment plan that fits every future parent’s goals, schedule, and values. Everyday miracles really do happen, and here at University Reproductive Associates, we’ve helped thousands of couples become loving families. From the moment you call us until the time you leave, you will receive the finest personalized, compassionate, and confidential reproductive care. Our physicians are award winning, and leaders in their field. Our multidisciplinary team of medical experts is committed to providing you with the best fertility care. As one of the most experienced infertility practices in the United States, University Reproductive Associates delivers the most comprehensive expertise and clinical care to help couples become a family. Our physicians are faculty members in Obstetrics, Gynecology and Women’s Health at Rutgers – New Jersey Medical School. We also participate in cutting edge IVF/Infertility research projects funded by both industry and the National Institutes of Health (NIH), which allows our patients access to the most up-to-date care possible. University Reproductive Associates utilizes the most advanced state-of-the art diagnostic testing procedures and treatment options to assist our patients in reaching their dream of having a healthy baby. Our team of expert physicians, laboratory specialists, nurses and staff delivers care 365 days a year, allowing you a greater chance for success. We embrace the fact that the path to parenthood is different for everyone. We're dedicated to helping intended parents of every race, gender, and sexual orientation build their families through surrogacy. There is no greater gift than the gift of family, and we're proud to be your dedicated partner on your journey to parenthood. 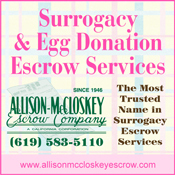 As one of Connecticut's first full-service surrogacy matching agencies, we operate under the firm belief that every successful surrogacy journey starts with the right match. Specializing in assisted reproductive technology law, our Founder and Legal Director, Victoria T. Ferrara, approaches the surrogacy process with the utmost sensitivity and professionalism, protecting your best interests as an Intended Parent and helping you build the family of your dreams. Camp Hawkeye is the un-traditional camp! Camp Hawkeye is for ALL HUMANS! A sleepaway camp for 8 to 17 year olds and maintains an organizational commitment to creating a diverse community. With 60 campers and 25 staff Hawkeye is perfect for first time campers of any age. Hawkeye includes campers and staff from a variety of social, ethnic, economic, religious, and geographic backgrounds. Hawkeye is different; with the feel of family and the healthy experience of the outdoors, Camp Hawkeye uses the joy and fun of camp to break down social and cultural prejudices, misconceptions and barriers. Camp Hawkeye is an organization with a mission and it’s not just to fill beds or make budget projections. The Hawkeye leadership is committed to the community and look forward to joining you in the healthy development of your child. Visit our web site www.camphawkeye.com or call 781-315-1297. The New School of Music is a community music school located in Cambridge, MA for adults and children of all ages and levels. NSM offers programs in a non-competitive, student centered learning environment from professional musicians with a passion for teaching. Programs include group classes, private lessons, workshops, and vacation programs. This year's vacation programs include Kids' Cabaret Musical Theatre in April and July, Stories and Songs from Around the World in August, and more! In NSM’s feature 3-week Kids’ Cabaret summer program, young singer-actors will have a chance to design, write, and perform their own musical theatre production. Students will learn the basics of staging, script writing, dancing, acting, and singing while incorporating team building and creativity. Before and after care are available for all summer programs. Please visit our website at www.newschoolofmusic.org for full details on all programs. Lesbian Psychotherapy and Life Coaching for Individuals Psychotherapy and Couples. The Crefeld School is a small, independent, coeducational school, serving approximately 100 students in grades 7-12. Crefeld is located on four acres of land in the Chestnut Hill neighborhood of Philadelphia. The Crefeld School graduates self-aware, empathetic, lifelong learners, who possess an appreciation for diverse perspectives, their role in society, and their ability to act as agents of change. • Trust-based system: ​Everyone at Crefeld is a member of the community. As members of this community, trust is essential to our functioning. • Commitment to social justice: ​We believe it is our responsibility to do what we can to eliminate bias based on race, ethnicity, religion, gender, gender identity, sexual orientation, socio-economic status, age, political affiliation, national origin, or disability. • Diversity, equity and inclusion: ​Crefeld is committed to building a culture that respects and embraces diversity, inclusion, and equity, believing that these values are critical for advancing knowledge, sparking innovation, and creating sustainable communities. • Strength-based approach: ​At Crefeld, we celebrate what students do well every day and help develop compensation strategies for areas of growth. • Embrace individuality: ​Through the advisory system, each student is recognized as an individual and has a well-supported designated advocate monitoring their education at Crefeld. An independent school in Los Gatos since 1935, Hillbrook’s verdant 14-acre campus boasts rustic trails, a creek, outdoor gardens, and more. The school has been at the forefront of the Maker’s Movement for more than 80 years, knowing that design, engineering, and creation should be a core part of every child’s educational experience. Hillbrook’s strong academic programs in math, science, the arts, history, foreign language, history, and more are highlighted by real-world learning experiences that challenge students to reach beyond remain a staple of the student experience. The recently-launched Scott Center for Social Entrepreneurship at Hillbrook, the only JK-8 center of its type in the world, partners with the local community, allowing our students to transform their curiosities, questions, and ideas into projects that reach beyond Hillbrook. Discover a place where students’ curiosity leads to questions and passion-driven experiences, in collaboration with fellow learners. That’s the Hillbrook Way.